For those who haven’t looked at a calendar too recently, Friday is the 4th of July. And if you haven’t figured out how you want to celebrate Independence day, here a few (free!) ideas for anyone in the DC, Maryland, and Northern Virginia area. Starting off at 11:45 am, on Constitution Avenue and 7th Street NW, there’s the America’s National Independence Day Parade, with a host of marching bands from all over the country, military and specialty units, and patriotic floats. Then starting at 8pm, with the gates opening at 3pm, there is the U.S. Capitol’s West Lawn with “A Capitol Fourth”, a 90 minute musical extravaganza, featuring the National Symphony Orchestra. 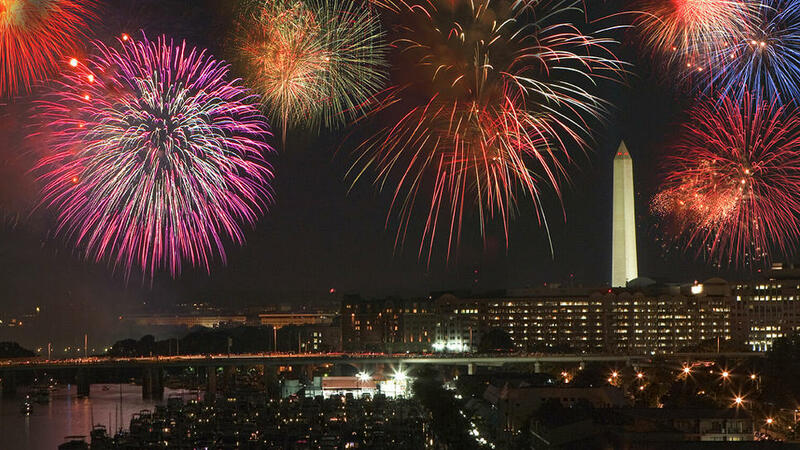 Finally, finish off the night with fireworks on the National Mall, starting just after 9pm. As this is a popular spot, pack a picnic basket and make a day trip out of it. If you’re in Western Maryland, there is fire on the Mountain Fireworks Display in the Deep Creek Lake Area (in Garrett County), presented by the Garrett County Chamber of Commerce. Starting at about 9:30pm, fireworks will be launched from the tip of the Bear Claw Tubing Park at Wisp Resort, onto the waters of Deep Creek Lake. There will also be fireworks at Fairgrounds Park in Hagerstown, with opening ceremonies starting at 6:00pm and fireworks at 9:30pm. For central Marylanders, there’s the parade in Annapolis, kicking off at 6:30pm along West Street and circling around Church Circle, followed by fireworks in Susan Campbell park at 9:15pm. There are also fireworks over the Baltimore Inner Harbor, starting at 9:30pm, with various musical performances starting at 7:00pm. In Dundalk, there a heritage parade starting 8:15am and fireworks at 9:15pm. Westminster will also be hosting fireworks at the Carroll County Farm Museun. Southern Maryland will be hosting fireworks and parades in the Town of Chesapeake at 9:20pm the night before, Sotterly Plantation in St. Mary’s, Waldorf starting at 9pm, and a watermelon bash in La Plata Town Hall, from 10:30am to 1:30pm. Finally, there will be fireworks over the water in Ocean City starting at 8pm with a free concert. Fairfax City has an Independence Day parade through the downtown area beginning at 10am, with musical entertainment beginning at 7pm and fireworks at Fairfax High School at dark. Falls Church’s George Mason high school has live music starting at 7pm, followed by fireworks at 9:20pm. Colonial Williamsburg will have live entertainment, a dramatic reading of the Declaration of Independence, an open air performance by the Virginia Symphony Orchestra, and fireworks in a patriotic setting. Celebrations begin at 5pm, fireworks at 9:20pm. This entry was posted in Uncategorized and tagged 4th of july, dc metro area, dc metropolitan area, dmv, Maryland, tips, virginia, washington dc on July 1, 2014 by discoverdmv.